Update: As mentioned below, this appears to be a StackExchange wide phenomena. There appears to be a bug with the site statistics. A few days ago, we had 3,000+ visitors per day, and over the last few days ago it went from 1,000, to only 23 visitors per day. As far as I can tell, we're still indexed by Google. If I were to guess, it may be because the site statistics are based on the cogsci.stackexchange.com and not pscyhology.stackexchange.com. Perhaps Google has just transitioned to using psychology.stackexchange.com rather than cogsci.stackexchange.com. Anyway, it's clearly a bug somewhere in the system. Yes, something is broken in traffic statistics for all sites; it has been reported at Traffic isn't updated correctly on Area51 and Traffic isn't correctly registered on Site Analytics. Hopefully SE developers will fix it soon. Not the answer you're looking for? 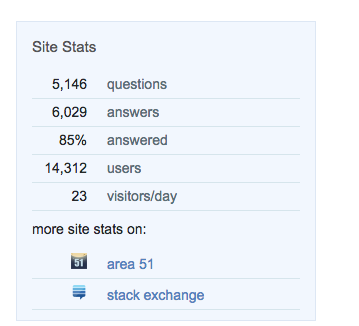 Browse other questions tagged bug site-statistics .